Some children may experience anxiety before or during their dental appointments. This is common for children who are getting ready for their first appointment or who have had major oral procedures at a young age. Fortunately, there are several things you can do to east your children’s fears and get them ready for their checkup. Most dentist offices that cater to children have toys and different stuffed animals in their waiting room for children to play with and take comfort from. However, if your child has a special friend, a favorite toy, blanket, or stuffed animal, allow them to bring this along to their appointment. Dentists are usually understanding and, as long as it doesn’t get in the way of their work, will let the child hold the toy while they sit in the chair. Make sure your child knows exactly what’s going to happen. If it’s a simple cleaning or even a more serious procedure, tell them about it. Let them ask questions and answer them truthfully. Make sure you use easy-to understand phrases and names. You may even consider sitting with them and showing them some pictures of dentist offices and supplies online so they can see what to expect. Before the appointment, spend some time with your child reading some of the many children’s books designed to educate and inform children about their first dental visit. You may also have them watch some episodes of television shows that discuss first dentist visits. These books and shows often explain why it’s important to go to the dentist and that there’s no reason to be afraid. Another way to help your child cope with the appointment is to offer them a reward or prize for good behavior after the appointment. Discuss what the child wants be it ice cream, a toy, whatever you feel is suitable. This gives your child something to look forward to after the visit. It’s important for children to develop good oral care habits at an early age. 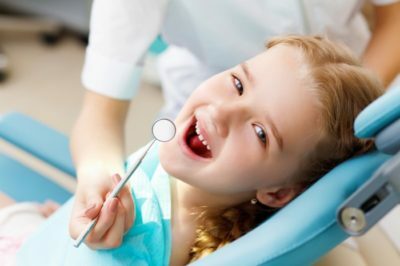 Helping children get used to the dentist and understand that there’s nothing to be afraid can influence their attitude towards dental care for years to come.